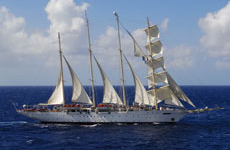 Star Flyer, one of the stars of the sea, is as fleet as the wind and as graceful as swans. This is a true clipper ship, reflecting her proud heritage in every inch of her polished brass and gleaming brightwork. Step aboard this unique vessel and discover a new age of sail, where the traditions of the past are happily married to the comforts and amenities of the present day. Star Flyer is a modern cruise ship in every way, created for luxury-loving passengers who also love the traditions and romance of the legendary era of sailing ships. Life aboard is blissfully relaxed, mich like traveling on a private yacht. You'll never feel confined aboard Star Flyer, with her spacious accommodations and expansive teak decks with ample space and two swimming pools. Valletta is the capital of Malta. This remarkable fortified city with its massive bastions followed the most advanced Renaissance ideas in town planning, with streets laid straight on a grid looking over the Grand Harbour. Outside the 'City Gate' is the famous Triton Fountain. 'City Gate' has public buses and vendors selling soft drinks and all sorts of traditional fresh Maltese bread and sweets. Freedom Square shows an extraordinary capital with buildings of fine architecture of different tastes and styles ranging from the Mannerism to Baroque to Rococo to Neoclassicism. Valletta is a fascinating city for wandering around looking at what used to be the Knight's own cathedrals and Auberges. The city's backbone is Republic Street, which runs straight through the city center to Fort St. Elmo. Valletta has several narrow, steep side streets decorated with traditional Maltese pastel colored balconies and a statue on almost every street corner. There are plenty of shops, cafes, and restaurants to choose from. Sicilia is the favorite island of Gods in traditional poetry. The most powerful and biggest ancient city in Sicilia is Siracusa. Its name may come from the native word "Siraco", which means "marsh", due to the bogs which surrounded the city. Or it may derive from a Phenician etymology signifying the presence of seagulls on its rocky shores. Few cities of the ancient world had the importance Syracuse had in Magna Grecia, the ancient Greek settlements in Italy. The most spectacular monuments in the archeological area surrounded by colorful Mediterranean vegetation are the Greek amphitheatre and the Orecchio di Dionisio (Dionysius' Ear). Besides touring the Archeological Museum that contains beautiful objects, Ortigia Island, the heart of the old Greek city, is worth a visit. Outside the city limits is Eurialo Castle, an incredible structure built to protect the city from the Cathaginians, and Pantalica, the great rocky necropolis in Anapo Valley. Pylos is a small town built in the natural bay of Navarino that is located in the southwestern part of the Peloponnese. There are two notable sites in the region that should not be missed - Palace of Nestor and two castles overlooking the Bay of Navarino - the castles Niokastron and Navarino. The Palace of Nestor is best preserved of Mycenaean palaces and is a complex of several buildings consisting of apartments and other royal rooms. Thousands of clay tables were also found at the site and give glimpses into daily life at the palace. The older castle of Navarino, called Palaiokastron, was built in 1573 by the Turks and was given over to the Venetians in 1686. Having changed hands on several more occasions, the castle was used in World War II by Italians and later served as German headquarters. Like any town on the Mediterranean, Pylos is filled with quaint restaurants serving traditional Greek fare. Pylos has been a popular seaside town for decades and has a lot to offer by way of entertainment in addition to historical sites surrounding the port. At the far end of Peloponnese, on the southern east coast of the peninsula looking on to Mirtoon Sea, stands Monemvasia. A distinctly shaped great rock rising from the sea only a few meters from the coast, it is often referred to as the "Gibraltar of Greece". On the north side of the bay there are a few houses in the small village of Old Monemvasia. Visit the cemetery where in 1989 the famous Greek poet Ioannis Ritsos was buried. The lower town of Monemvasia is called "the Fortress" today. A wall protects the lower town on three sides. There are several churches around like Panagia Chrisafitissa, Panagia Mirtidiotissa, Chistos Elkomenos, Agia Sofia. On the east side of the main square stands a house with a garden containing remains of the early Byzantine church. To the west, there is the "Stellakis" house that was reconstructed and gave a lot of information about the architectural details and appearance of the medieval town. A small zigzag path connects lower town with upper town. The Fort city of Monemvasia with a one and only gate turns dream into reality. A former capital of Greece and a popular port on the eastern Peloponnese coast, Nafplion impresses visitors with grand, medieval architecture erected by Venetians during the 15th century. The most dominant structure is Palamidi Fortress towering high above town. The port is a lively town with a scenic harbor, a picturesque center to explore on foot and pebble beaches. Several monuments remain from its Turkish past, including mosques and parliament building. Handicrafts and local costumes are on display at the Folk Art Museum. Palamidi Castle has an incomparable view from the fortress’ lofty position. Spend time strolling along the waterfront, exploring around main square and narrow streets of Old Town. Platia Sintagmator, the city’s main square, is fronted by a former mosque, now the meeting place of Greek Parliament. Here is also the Archaeological Museum, which features an outstanding collection of Mycenaean finds. The entrance to Akronafplia Citadel has a gate built of Roman bricks, a Byzantine gatehouse with frescoes dating from 1291, and Venetian bastions. From the port, don't pass up a tour to Mycenae. There is evidence that the site has been inhabited since 4000 BC, but reached its peak of civilization during 1500 - 1000 BC. It was here that the mighty Agamemnon ruled and the site still contains massive structures which give visitors a glimpse of what this magnificent city once was. Piraeus is the seaport for Athens, the capital of western civilization, which boasts a fantastic mix of classical ruins and vivacious modern life. Climb the hill of Acropolis to wonder at the Parthenon, join the lively Athenians in Constitution Square, and find a welcoming taverna for spirited bizouki music, plenty of ouzo to drink, and energetic Greek dancing. Piraeus is the largest harbor in the country. The white chapel of St. George at its summit has a theater bearing the same name. The hill of Nymphs is the site of a planetarium, which is located above magnificent Thesseio temple. Among all of these hills, Acropolis is the one that glorified Athens and the whole Greek world and became the symbol of the western civilization. Bays and small rocky or sandy coves dot the area and during the summer are filled with Athenians and foreigners enjoying their beauty. Rates are cruise only, per person, based on double occupancy. Government fees/taxes additional for all guests. Rates are subject to availability and may change without notice. Restrictions may apply. Fuel surcharges may apply. Please ask your travel counselor for details.